The comet goldfish is one of the oldest and best known variants of the common goldfish. It was first bred in the late 1800’s in the United States, and has since become one of the best known and most widespread fish in the aquarium hobby. Because of its extremely prolific nature, comet goldfish are usually sold for mere pennies and can often be found in crowded feeder tanks or in tiny prize bags at fairs and carnivals. These terrible conditions lead to shortened life-spans, and often result in the fish suffering from any number of parasites and diseases. But if you can find a healthy comet goldfish, they can grow up to 13 inches in length, with some being reported much larger. They will also live up to 15 years if provided with a proper housing and food – a far cry from the month or two that most will survive when kept in cramped fish bowl. Because of their aquarium busting size, they should only be kept in the largest tanks, although they can be kept in smaller tanks while they’re still very young. 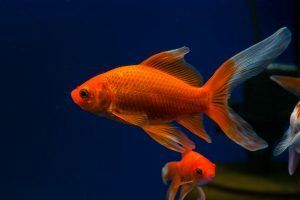 The minimum size tank for a small group of comet goldfish should be a 55 gallon tank, though a 75 gallon tank is preferable. This will give them a chance to grow to a full and healthy size – something that can’t happen in smaller tanks. When it comes to choosing a filter for goldfish, the mantra “bigger is better” applies here. 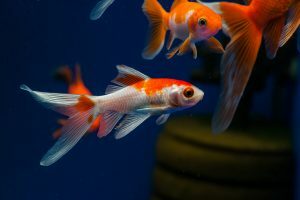 The best filter for a goldfish tank is a canister filter, but you can achieve the same results (and spend far less money) by using a high quality hang-on-back filter in conjunction with a sponge filter. It’s important to remember that goldfish are cold-water fish, and will do best if kept in a cool room. They should never be kept in a heated tank or in an overly hot room. If their tanks temperature gets too high, it may result in permanent nerve damage to the goldfish. Since comet goldfish require coldwater, they should never be kept with tropical fish, as the tank will either be too warm for the goldfish, or too cold for the tropical fish. Some good tank mates are gold barbs, dojo loaches and some people have had success with zebra danios. But the danios will nip at the goldfish if they aren’t kept in a school of at least six, and some are nippers regardless, so add danios with caution. Getting comet goldfish to accept food is not difficult – they will eat nearly anything that will fit in their mouth. With that being said, feeding them properly is what can be more difficult. In the wild goldfish are omnivores, and they feed on plant matter, algae, insects and small crustaceans. But their diet is primarily composed of plant matter and algae, and it’s important to replicate this in the home aquarium. If their diet doesn’t contain enough fiber from plants and algae, they may develop a condition called bloat. When a goldfish develops bloat, they will swell up, and generally just flop around on the bottom of the tank. Most cases of bloat can be cured with shelled peas, which will clear out the “blockage” causing the bloat. But it’s obviously best to ensure that the goldfish never develop bloat in the first place. This can be done by providing comet goldfish with a wide variety of vegetables and Spirulina based flakes or pellets. Their favorite vegetables are shelled peas, cucumber, zucchini medallions and brocoli. They will also eat many types of aquatic plant clippings taken from other healthy tanks, so they can be a good way to dispose of excess plants. I personally feed my goldfish Hikari Goldfish Gold , which in my opinion, is one of the best prepared foods on the market. Breeding comet goldfish in the home aquarium is difficult and should generally only be done in outdoor ponds. If you do plan on breeding them in an aquarium, then a separate tank must be set up to separate the parents from the eggs. Like most cold-water fish, comet goldfish require a trigger to start spawning. The easiest way to do this is to lower the temperature for a period of around one month, and to reduce the light period to less than 8 hours a day for the tank. Adding some high quality foods to their diet can also help to condition the comet goldfish for breeding, and frozen or live foods should be fed daily in addition to the usual vegetables and herbivore flakes and pellets. After a month of lowered temperatures 58F (14C) the temperature should be slowly raised until it reaches the low 70s (21C). The light cycle should also be increased until the tank is receiving 12 hours of light a day. This will generally trigger spawning behaviour, which is always easy to spot. When spawning has been triggered, the male will begin to chase any females, nudging the stomach in an attempt to make her release her eggs. After a short time, the female will release up to 1000 eggs, which are usually released into any live, or fake plants in the aquarium. The parents must be removed from the tank as soon as spawning has been successful, as they will happily eat every last egg in the aquarium. The eggs will hatch after a day or two, and after 24-48 hours, they will become free-swimming. At that time they can be fed infusoria, baby brine shrimp or commercially available fry foods.